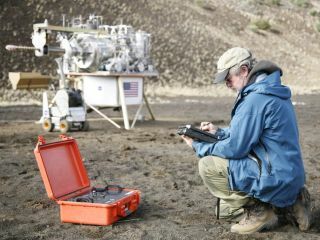 NASA's David Blake is the Principal Investigator for the CheMin instrument on the Curiosity rover. NASA's David Blake is the principal investigator for the Chemistry and Mineralogy instrument, or CheMin. This instrument will direct beams of X-rays through samples of Martian rock in search of clues to the red planet's past. I'm a geologist by training. I work in the Exobiology Branch at NASA's Ames Research Center, so it's not the ordinary kind of geology. I've done a lot of work on meteorites and interplanetary dust, and also on lunar materials. The instrument activity that I started was kind of a sideline. I really was doing mostly research on rocks, with application to astrobiology or exobiology. From there, I went on to regular meteorites, mostly carbonaceous chondrites, which are the ones that contain about 1% carbon. People who do organic chemistry have found organic abiotic organic compounds in these meteorites. I've studied sub-microscopic interstellar diamonds that were found in these things. Then I moved on to the ALH 84001 meteorite, which is one of the meteorites found in Antarctica that was determined to come from Mars. I've spent a bit of time on that. I’m an electron microscope spectroscopist by training. I modified an electron microscope to work at 10 degrees Kelvin, which is really cold; it's -263 degrees Centigrade. I introduced gases and various things into the microscope and condensed them down into solids at that temperature. That's very similar to what happens in cold molecular clouds. Then I studied the phase-transitions of water-ice and solid gases at those low temperatures. The Chemistry and Mineralogy X-ray Diffraction Instrument, or CheMin, will examine powdered rocks and soils for clues as to their origin. What is it that you do specifically with MSL? While doing all this other stuff, about 22 years ago, I started working on a miniaturized X-ray diffraction instrument. X-ray diffraction is a way of identifying what minerals are in a rock. There are many ways to find out what minerals are contained in a rock, but X-ray diffraction is the best. It's kind of the gold standard on the Earth. When I came to NASA, I saw all these infrared instruments and things that we use to find out what mineralogy might be on a planetary surface, I was thinking that X-ray diffraction would be a nice addition to the mix. XRD instruments are actually pretty complicated. The ones you see on Earth are typically the size of big refrigerators, and they use thousands of watts of power and have lots of moving parts. I started with a simple camera, replacing components, making the instrument smaller, and figuring out ways to get rid of some of the movements that were required in the bigger instruments. It took about 15 years to work on this and get the funding to make small X-ray tubes and detectors. There was just a lot of figuring stuff out to make an X-ray diffractometer small. The one that we have now on the Curiosity rover is about the size of a large shoebox. So that's pretty much what my role is on Curiosity. I'm one of the instrument principle investigators. We analyze soils and powdered rocks that are delivered to my instrument. The interesting thing about sediments and rocks and the minerals they contain is that these minerals have known ranges of stability, chemistry, and so forth. If you can find out what minerals are in a rock or a soil, you can say what the environment was in which they were formed. Basically, what CheMin does is analyze soil or rock delivered to it. From that, we can tell the conditions under which these rocks formed. The rocks in Gale Crater, where we landed, could be as old as four billion years. I can tell you about the environment that existed four billion years ago by looking at what minerals are there. The mission of Curiosity is to find so-called habitable environments, environments where early life could have originated or persisted. For that you need clement temperatures — temperatures from not far above the boiling point of water to slightly below freezing, you need water, and some form of energy. You can get chemical energy from rocks through mineral reactions, so the CheMin instrument can also find out if there are minerals there that could potentially have produced energy used by organisms. We are looking for these habitable environments, and once we find something like that, then another instrument called SAM will do organic analysis to find out if there are any organic molecules there. I've always been a mineralogist and geologist not an organic chemist. I always worked toward what used to be called "Exobiology" problems, but I was kind of an odd duck in the Exobiology Branch. The work that I do involves ancient rocks on Earth, Mars, and in the solar system, and understanding how those rocks and minerals formed, and essentially how the biogenic elements were cycled from the beginning of the solar system to the present time. I think all of my work, even starting with the interplanetary dust, had to do with the origin and processing of the biogenic elements, the ones contained in life — hydrogen, carbon, oxygen, nitrogen, sulfur, and phosphorous. Basically, it's a key question in Exobiology and Astrobiology — how do these biogenic elements originally come together to form organic compounds and how do they ultimately wind up being us? The CheMin instrument was installed on the Martian rover Curiosity on June 15, 2010. With MSL, you're specifically searching for those elements? Obviously, there are nine other instruments on Curiosity, not just CheMin, so it's definitely a group project with all of these instruments to determine, first of all, what the environment is, and secondly, if any organic compounds persist there. Another interesting thing about Mars and one of the reasons why we went there, and to Gale Crater in particular — we went to a place on Mars that is probably 3.5 to 4 billion years old. That was the time when Mars was very much like the early Earth, when there's clearly evidence that water was present, there was a denser atmosphere, and it was warmer and more clement. We don’t have any places like that that are left on Earth because the Earth is a dynamic, tectonic planet. We have these tectonic plates moving around, where rocks are formed at mid-ocean ridges and destroyed at convergent plate boundaries. We have almost no really old rocks on the Earth because they have either been melted, or heated to the point that you can’t tell what they were originally. If you looked around for a 4 billion year-old rock on Earth, you wouldn't find one. If you look at the existing slivers of rock that are maybe 3.5 to 3.9 billion years old, most of them have been heated to the point that you almost don’t know what the rock was in first place. By going to Gale Crater and looking at sediments and rocks that are very old, we're getting not only a snapshot of early Mars, but also snapshot of what early Earth might have looked like at the time when we think life evolved.